The operators of the Horse Hill exploratory oil site near Gatwick have applied to vary their environmental waste permit to allow them to test the well. The application, by Horse Hill Developments Limited (HHDL), was published by the Environment Agency yesterday. A public consultation runs until 25th June 2015. An article* published in the International Journal of Human Rights calls for human rights impact assessments of fracking proposals. The latest press release from UK Oil & Gas Investments gives a new estimate for the volume of oil in the Upper Portland Sandstone conventional reservoir in the Horse Hill area of around 21 million barrels. It also says that Horse Hill Developments Ltd is proceeding with applying for the relevant permissions. The press release, dated 11 May 2015, says, “Subject to approval by the relevant authorities, the Company intends to flow test this conventional sandstone zone as part of a wider test programme of the HH-1 well later in 2015. A successful test would be followed by a full technical resource assessment, and the identification of potentially recoverable resource volumes. Campaigners from Surrey will be at both events, please join us! No Dash for Gas is holding an international weekend of climate action, near Didcot gas-fired power station in Oxfordshire, to take creative direct action against the fossil fuel industry and build the movement for energy democracy. 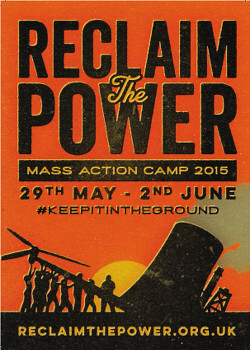 The weekend includes workshops, training, and a day of mass action against the fossil fuel industry on Monday 1 June. The Climate Coalition is coordinating a mass lobby of parliament on 17 June. The idea is that 10,000 people will meet with our MPs in the streets around Parliament, all at the same time, and urge them to protect all the things we love that are threatened by climate change. The event will have a festival feel, with music, entertainers and art installations and aims to engage a wide cross section of people through the Coalition’s 100 member organisations. General election result: what does it mean for fracking? Anti-fracking campaigners are dismayed at the re-election of the Conservative Government – and the reappointment of George Osborne to his old job as Chancellor of the Exchequer (with the additional role of First Secretary of State). And a letter George Osborne sent to the Cabinet Committee on Economic Affairs last September shows how keen he is to fast-track shale gas drilling. The letter urged ministers to make dozens of interventions to speed the process up. Read Osborne’s letter and recommendations on the Guardian website. Campaigners have expressed qualified relief that the post of Energy and Climate Minister went to Amber Rudd. She is at least convinced of the threat of human-made climate change, unlike some of the senior Tories. Campaigners have a job on our hands persuading Ms Rudd that shale gas is a red herring – we need to focus all our efforts on reducing energy demand and providing people with locally-owned, sustainable energy harnessed from the sun, sea and wind. Last month an announcement by UKOG – the company which has drilled at Horse Hill near Horley – that there could be up to 100 billion barrels of oil under the Weald Basin caused a media frenzy. See the last two posts on this blog for some examples of starry-eyed reports which portrayed Horley as the new Dallas. Less widely reported was the follow-up statement a week later that UKOG actually didn’t know how much oil there was in the 55 square miles it is licensed to explore – let alone the wider Weald basin (estimated approx. 1,100 square miles). Friends of the Earth South East campaigner Brenda Pollack said: “UKOG has backtracked on the wild claims it made and admitted that it has no idea how much oil is under the Sussex Weald.